Organization allow to regroup developers on RIDE Server and allocate resources. Resources and permissions are controlled and allocated within RIDE Server admin dashboard by system administrator. 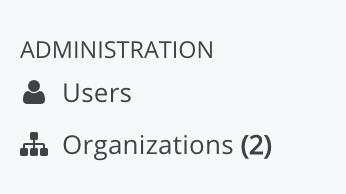 Admin: Organization's admins are able to manage the organization. Admins can edit settings, manage members, resources and sub-organization. Members: Organization's members are able create workspace, manage own workspaces and use any other workspaces they have permissions for. Alternatively there is System Admin role, on RIDE Server System, who is able to create root organizations, manage all the resources, members and sub-organizations. Workspaces created in an organization use organization resources granted and allocated by the system administrator. Resources for organization are taken from the parent one. Admins can control whether all, or a portion of the resources, that are shared with the sub-organization. Root organizations are the starting point of each group of developers. Multiple root organizations are allowed onto your system. Root organizations can be created only be the System Admin. The management of the root organization's resources is also allowed only to the System Admin of your RIDE Server installation. RIDE Server system administrator is able to create organizations. A new page is displayed with all organizations in your system. Click on the top-left button to create a new organization. A new page is displayed in which an organization name should set and organization members may be added. The list contains the general information for each organization: number of members, total and available RAM and number of sub-organizations. You can change an organization member's role or remove them from the organization at any time. Note: Users with the green checkmark beside their name already have an account on your RIDE Server system and will be added to the organization. Users without a checkmark do not have an account and will not be added into the organization. The creation of sub-organization can be done from organization details page by selecting Sub-Organizations tab and clicking "Add Sub-Organization" button. The flow of sub-organization creation is the same as for orhanizations. Organization settings are visible to all members of the organization, but only the RIDE Server system administrator is able to modify the settings. Action restricted to: RIDE Server system administrator and admins of the organization. To rename an Organization, click in the "Name" textfield and start editing the name of the organization. Once edited, the save mode will appear - click on "Save" button to update the name. This action is not possible for members of an organization. Users have to contact organization's admin or RIDE Server system admin. To delete an organization or a sub-organization, click on "Delete" button. This action can't be reverted and all workspaces created under the organization will be deleted. All members of the organization will receive an email notification to inform about organization deletion. The organization default caps are taken from the system configuration. The admin of the organization can manage only the limits of it's sub-organizations. Click "Save" to confirm the update. You'll get a confirmation popup, where you can confirm or cancel your action. The members that are removed from the organization will receive an email notification.